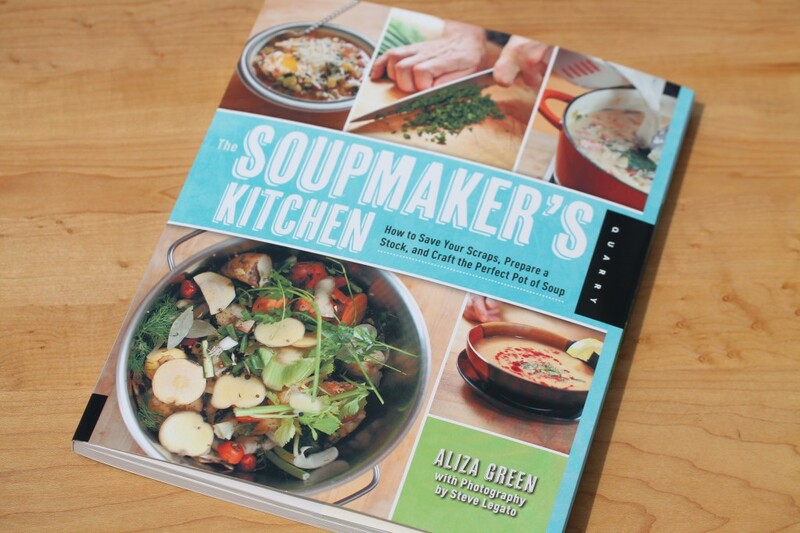 From beginners to novice, The Soupmaker’s Kitchen cookbook by Aliza Green is the perfect manual to assist you in making just about any category of soup. 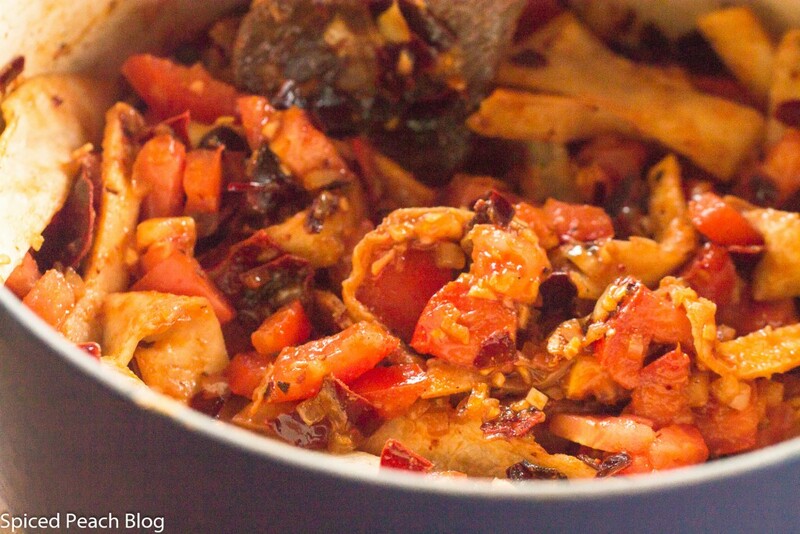 Have you ever wondered how you might use some of those leftover vegetable scraps? How to prepare a stock? Or would you just like a simple, straightforward recipe on crafting the Perfect Pot of Soup? If you fit into any of these categories,“The Soupmaker’s Kitchen” is surely among the perfect of cookbooks for preparing excellent soups throughout the year. I received this cookbook shortly after its publishing, well, I actually had a sneak peek beforehand too, having had lunch with Aliza one day as this cookbook readied to hit the shelves. Come to think of it, we ate at a local Mexican restaurant, and so today’s soup, Sopa de Tortilla, with Chicken, one of many delicious, well balanced flavor recipes in this book ties together well. 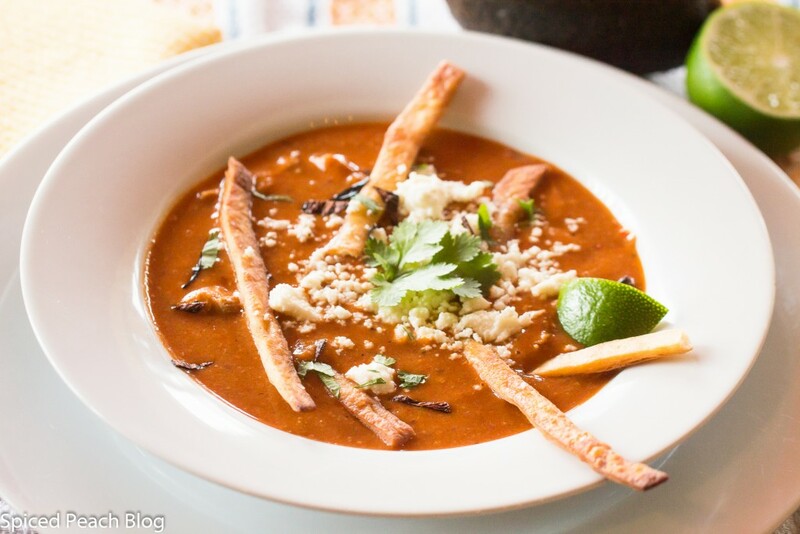 The Sopa de Tortilla soup according to the book, is also known as Sopa Azteca, and with many versions in Mexico, the soup was initially developed as the frugal cook’s way to use up stale tortillas. Using small corn tortillas in this recipe, you cut them into strips, fry them, reserving some for garnish but cooking most of these fried tortillas right in the soup pot with its complex depth of flavor combinations, chilies, tomato, chicken, and lime. Sensational. Really. I hope you give it a try and let me know what you think. The fun and insightful stories are always part of Aliza’s cookbooks, and anyone in the Philadelphia food community will share the near encyclopedic knowledge Aliza possesses on practically any type of food ingredient or preparation included in each of her now 16 cookbooks through stories, history, culture, ingredients, usages, and many just plain simple all around cooking tips. Aliza was the first interview and blog post I printed on Spiced Peach Blog, “Starting with Ingredients.” I also posted another soup from Aliza’s cookbook, “The Soupmaker’s Kitchen“ called Billi Bi Soup, based on a traditional dish of Brittany, France, a delicious, creamy mussel based soup that continues to be one of my summer favorites. I just stopped by to see Aliza recently and have lunch at the small cafe she opened and currently runs on Wissahickon Avenue in Philadelphia, Baba Olga’s Material Culture, a sort of Bohemian type place whose large warehouse style building houses both auction house and retail creative home furnishings from around the world. Creative sandwich style foods with simple but specific presentation, my dish, local Pennsylvania Hot Barbecue Beef Short Rib with Vermont Sharp Cheddar and Green Meadow Dill was mouthwatering sensational, to say the least. The cafe also serves, apropos, daily homemade soups. Stocks, Broths, Fish and Seafood Soups and Stews to Potages, Pures, Creamy Bisques and lots in between, Panades, Bean Soups, Hearty Soups, and just in time for summer: Chowders and Chilled Soups, for any of you soup lovers out there this book pretty much reads as a soup lover’s delight. You might be able to tell how fond I am of Aliza, but then, even if I didn’t know her personally, or even know about the talent and knowledge of this award winning chef, “The Soupmaker’s Kitchen” would still easily earn a special spot on my cookbook shelf to be used and prepared from again and again. Hope you enjoy it too! Cut off the stem ends of the guajillo and pasilla chilies. Cut down the sides of the chilies. Open up the chilies, shake out the seeds, discard. 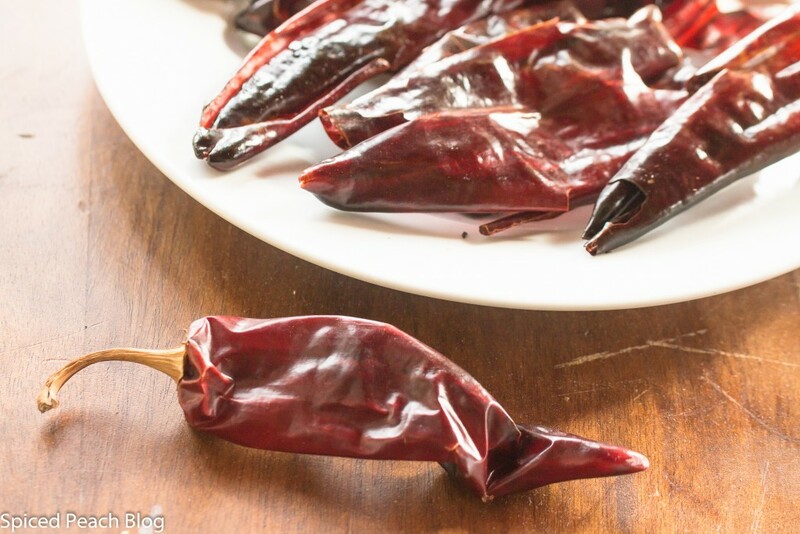 Use scissors or a knofe to slice the pasilla chilies into thin strips and reserve. Heat a large heavy skillet, preferably cast iron, until just beginning to smoke. Add the guajillo chilies, pressing down with a spatula to flatten them and cook briefly, just until the chilies begin to smoke. Remove from skillet and reserve for soup broth. Repeat with the pasilla chile strips.Cut the pasilla chiles crosswise into thin strips and reserve for garnish. Meanwhile in a medium pot, heat 2 cups of the chicken stock, add the chicken thighs and bring the liquid to a boil, skimming off any white foam. Reduce the heat, cover, and simmer until the chicken is firm, about 15 minutes. Allow the chicken thighs to cool in the broth, and then drain reserving the broth and the chicken. Slice the chicken thinly against the grain and reserve. In a large soup pot, heat the oil, add the onion, garlic, cumin, and crumbled toasted guajillo chilies and cook until the onions are soft and tender but not browned, about 5 minutes. Add about one third of the fried tortilla strips and the tomatoes and stir to combine. Add the reserved chicken poaching broth and the remaining broth and bring to a boil, reduce heat, cover and simmer until liquid has mostly been absorbed and chilies are soft, stirring occasionally about 15 minutes. Working in batches, blend the mixture in a blender, or immersion blender until smooth. Pour the pureed mixture back into the soup pot. Add the lime juice and kosher salt to taste and bring back to a boil. Add in the chicken, keep on low heat. Prepare the garnishes, fried tortilla strips, toasted pastilla chile strips, lime juice and cut limes, crumbled queso fresco, cilantro, sliced avocado. Taste soup adding more salt or lime juice as desired, ladle into bowls and top with garnishes, serve immediately. Cut the tortillas in half and then crosswise into strips. Heat oil in a medium heavy pot, wok, or cast iron skillet, filling the pot no more than 2/3 full with oil. Heat until oil is shimmering and hot, add the tortilla strips a few at a time so the temperature doesn't drop and so they don't stick together. Fry, stirring so they cook evenly until crisp and browned about 2 minutes. Scoop the tortilla strips from the oil with tongs or slotted spoon. Drain on a wire cooling rack placed over a baking tray or on paper towels. To quicken preparation time, I prepared the tortilla strips using a large nonstick pan, using half the amount of oil, turning the strips back and forth until golden brown colored. This entry was posted in Cookbooks, Soups and tagged Aliza Green Author, Sopa de Tortilla, Sopa de Tortilla with Chicken, The Soupmaker's Kitchen, The Soupmaker's Kitchen Aliza Green. Bookmark the permalink. Post a comment or leave a trackback: Trackback URL. Yum! Now that would have went perfect on Cinco de Mayo with a cold Cerveza! Phil recently posted…Fleet Week, Letterman, NYC News, and $30 hot dogs. 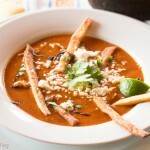 Hey Phil, You are right, this soup would be perfect for Cinco de Mayo with a cold Cerveza! Thought of you today being in New York making a presentation on Vietnamese foods at Thomson Reuter’s Times Square. We’ll have to catch up for a cold Cervesa at one of your recommended spots sometime. One of the other panelists was the chef and owner of Ngam Restaurant in East Village, have you been there? She even invented a “Thai Burger” you should check it out! Have a terrific Memorial weekend. I love soups and stews. I have a cookbook too, but often find myself looking online at my favorite sites for recipes. Nevertheless, I buy more cookbooks and enjoy my favorites. This soup looks fabulous! Pinning. 🙂 Enjoy the long weekend, Peggy! Kelly recently posted…How Would You Describe Yourself In Three Words? Hi Kelly, thanks so much and the soup is terrific, bet you and Antonio would enjoy it. Oh what a collection of cookbooks I have, though I tend to enjoy reading them and for inspiration, but there are a number of recipes in The Soupmaker’s Kitchen I do plan on trying, and then of course, with the CCC I’ve cooked more recipes from any cookbook ever! You have a fantastic long weekend too- hope you had a Happy Anniversary celebration! That dish looks great. Perfect for Spring. I bought and really enjoyed another book by Aliza you covered in an earlier post. I’ve already ordered a copy of The Soupmaker’s Kitchen. Hey Jay, thanks so much. Hope you enjoy making the soups as much as I do, lots of simple and interesting one bowl meals for every season. Splendid article as always !! Thank you so much for sharing and I am looking forward to read more great recipes and stories from spiced peach blog. Thank you Samuel, I’m happy you enjoyed it and very much appreciate you being a part of the Spiced Peach Blog Community. Dear Peggy, I am a total novice at Mexican food and I have read this lovely post of yours with great interest. I would love to give this wonderful recipe a try but first I will have to look up those chilies that you used as I absolutely no idea where to get them around here – but I shall try. Great post, wonderful looking presentation and great cookbook to own, dear friend! I am more than willing to follow your lead when it comes to cookbook recommendations as I believe we share a lot of common interests and tastes. Hello Andrea, thank you much and yes this soup is very lovely, I’m certain you would enjoy it. Yes, these style peppers are more common from Mexico, and in the West and Southwest regions of the states, I will be interested to see if you are able to find them in your parts. The Soupmakers Kitchen is a wonderful cookbook with many interesting recipes, and serves perfectly for those basic, as well as more serious cooks as you and I. Looking forward to our CCC gathering tomorrow and I’ve a funny story to share in its regards. See you then.